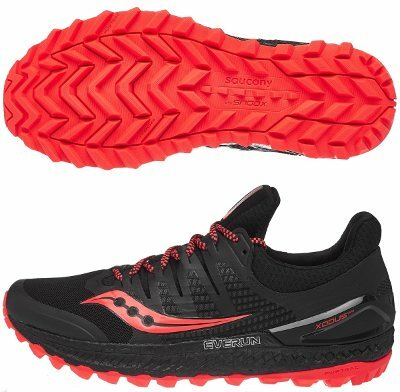 Saucony Xodus ISO 3 are neutral trail running shoes. So many changes in revamped Saucony Xodus ISO 3 which increases weight up to 20% mainly because moving from SSL EVA based midsole with EVERUN layer on top to one completely made of flagship EVERUN foam, something which has already happened in other premium Saucony running shoes like Triumph ISO 4. It is interesting to see how different brands try to reduce weight in road running shoes lineup but goes in the opposite direction from trail running shoes, maybe to work against rising popularity from maximalist HOKA ONE ONE. Among all changes from its predecessor Xodus ISO 2 one of the most visibles without wearing it is the new upper built around latest development of ISOFIT system which is far away from initial external and rigid cage to become fully integrated in the running shoe to benefit both comfort and fit. In order to increase upper's durability, custom internal reinforcements have been in forefoot while tongue is now bigger. Heel area mimic Achilles protection first premiered in Adidas running shoes but also used in latest Nike models like Zoom Pegasus Turbo. Major highlight in current Xodus ISO 3 is the new full length EVERUN midsole, the flagship foam from the american brand. It is official that EVERUN is heavier than well-known SSL EVA but feedback from unbiased runners is mandatory to back performance when running offroad because reviews on beautiful Freedom ISO 2 are really positive. Impressive PWRTRAC keeps TRI-FLEX configuration but features minor improvements in lugs to adapt better to different grounds to improve tear resistance while featuring great traction and grip.